First German editon, first printing, (Deutscher Erstdruck is stated on the copyright page). Copyright © 1970 by L. Sprague de Camp. Month stated on copyright page ("April 1979"). Day deduced from the series' 4-weekly publication schedule. 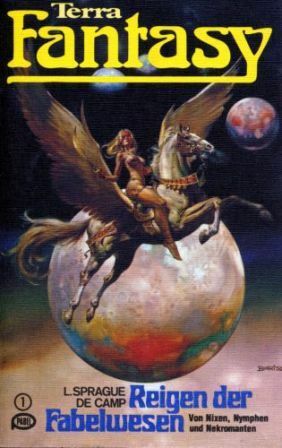 Cover art is credited on the copyright page, the artist's signature is clearly visible. Other prices: S 28 (Austria), sfr 3.80 (Switzerland), L 2,000 (Italy), lfr 66 (Luxemburg), hfl 4.00 (Netherlands). As usual in this publication series, the cover counts as page 1. The book ends on the unnumbered page 159.